We’ve been testing the Bit-Mining cloud mining service for a while already and our experience with it was actually Ok while the service was working properly. The problem is however that the service was not functioning properly pretty much most of the time since we started testing it and yet again it seems to be experiencing some serious issues. The last time that the service was apparently “hacked” it took more than just a few days to restore the normal operation, then there were some issues with the SSL certificate of the service and now again they have been having some issues for more than a few days already. What we do not like is that the people behind the service are not very active in communicating about the problems when they have some, so the users can be rest assured that they are going to be fixed. And since they do have problems so often what is happening is that their users are going away and so are we. We decided to give a second chance after their last problem was fixed, but now we can already draw our conclusion – stay away for the service. They do have too much problem, take a lot of time to fix them and you as the user only get some headaches from all of the trouble associated with it to be worth it. We apologize for the lack of communication during these last few days. As you all have noticed, there have been many issues and down times as of late with the website. We have received many hack attempts in the last few days at Bit-Mining.Co, which has caused us many issues. All our staff members are working together to fix all the issues and bring the website back to normal activity as soon as possible. All open tickets should be resolved and withdrawals processed in the next 48 hours. 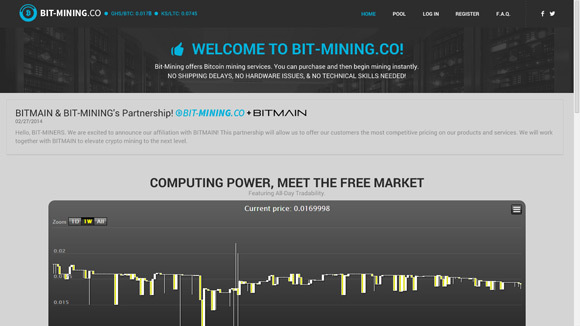 at: Support@Bit-Mining.Co . Again, we apologize for the lack of communication. From now on, we will keep you updated more frequently by using social media pages. The problem is that since then nothing new has been available as information, no communication through the Facebook or Twitter pages that are supposed to be used for things like that. And the service is still not properly functioning after a few days have passed already. Again, we’ve had enough of issues and recommend to stay away from that service and if you are using it and still haven’t withdrawn your coins you should consider doing so after they finally fix this problem as well.